It's Tarot Tuesday! This is the day we work on our intuition, so take a few moments to ground yourself: A few deep breaths, close your eyes, and relax. Now, open them, and select the card that speaks most to you. Only choose one, so you don't cheat yourself from this exercise. Are you feeling nurtured and cared-for right now? Are you the one caring for someone else? 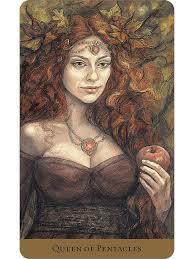 The Queen of Pentacles, like all the court cards, often stands in for an actual person in your life. In that regard, she would represent a woman, likely with dark hair and dark eyes. 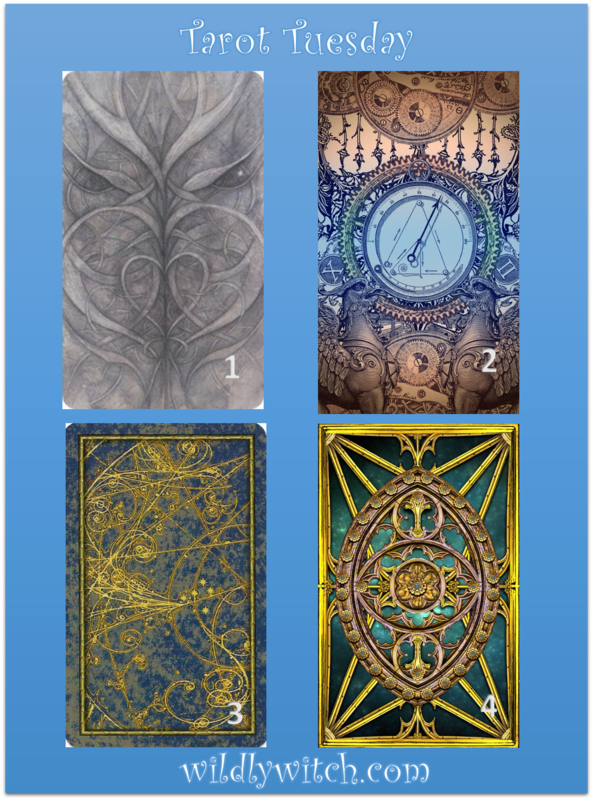 However this is not always the case, as these cards can also represent energetic influences in our lives. 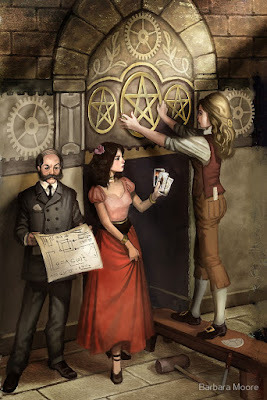 The energy of the Queen of Pentacles is normally quite the feminine archetype; hearth, home, motherhood. This card can indicate that you will be spending time, money, and energy on your home, getting it to be more comfortable. People will be looking to you for insight and/or advice. You will be able to help them, if you are so inclined. This is a time period when you can get a lot accomplished. Take advantage of it! Are you getting along with your co-workers as you put together the big project? Has someone turned to you to ensure that a job will get done? Is there a task at hand that you know will be completed on time and as perfect as humanly possible? Have you realized lately that you are the best person for a certain job? When an organized approach is needed, have you been getting the call? Is your partner allowing you room to be yourself because you bring so much to the relationship? The Three of Pentacles is a card that would indicate all of these and more issues associated with competency and hitting your stride. The 3 of Pentacles is a very positive card, particularly with regard to work and career questions, but it's a good overall omen that you are in general, doing well. This card tells you that the people around you appreciate you and your efforts, and notice the quality of what you do, even if you don't get a paycheck. The Three tells you to keep doing what you're doing as you are on the right track. In general this card points to determination and ambition. It's about getting things done, and testing and proving that you've got what it takes. This is a sign that you should move forward with whatever you have in mind (and in your heart) and give it your best shot. Remember, though, that you'll need to use both your intellect and your heart, in order to be truly successful. 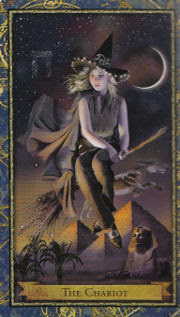 An exciting card in any Tarot Reading is the Three of Wands. The Three of Wands is a card that almost always represents the person receiving the reading. 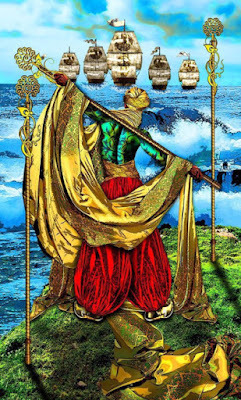 When the 3 of Wands appears, you are likely to find that your finances are going much better, in fact this can be the month that your proverbial ship has come in. You are likely to be feeling very strong and with good reason. You may be finally experiencing some important success after you've been through some difficulty. The Three of Wands indicates opportunities to expand your horizons, through study, travel, business enterprise and learning. You need to become more aware of the opportunities that exist for you right now, as there may be more than you are aware of. To best see and take advantage of them, you must concentrate, cooperate, and remain open-minded. You may be more aware that your best opportunities lie outside of your current environment, so it is time to think BIG. Consider what you can do to open doors for yourself and create more development and self-exploration opportunities. It also signifies the changes and challenges that are up ahead and that are associated with expanding your horizons and entering new territories. Given the man in this card can see far ahead of himself, then you are likely to already be aware of the upcoming changes and challenges and can prepare for them ahead of time. How did you do? Are you starting to see changes in your accuracy? What big take-away(s) do you have from this exercise? As always, I want to hear from you. Please share your experience in the comments below, or on the Facebook page. Let me know how I can support you further in this exploration.